Full service dining room open to the public Tuesday - Saturday evening. Special event menus are created with buffets, hors d' oeuvres or plated meals. 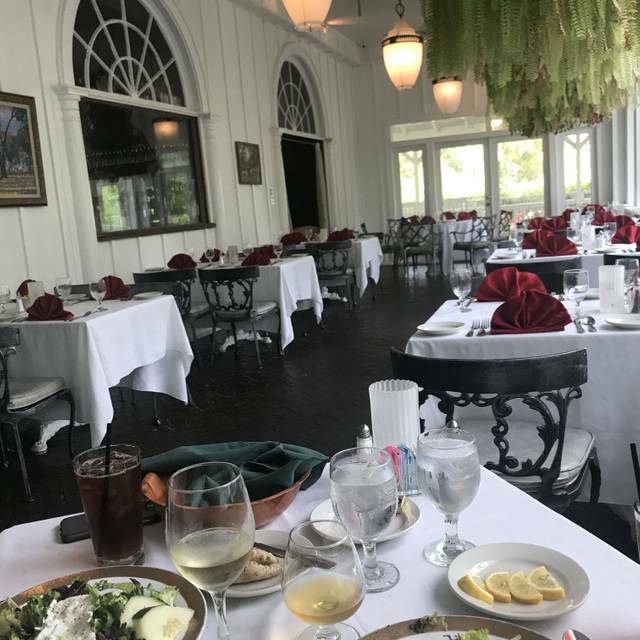 Our restaurant is a beautiful Victorian-style mansion, nestled among towering oak trees,offering an unforgettable experience. A Memorable Dining Experience. The Hilltop’s unique old-world atmosphere makes for the perfect setting for your special occasion. Let us help you create your unforgettable evening. The Hilltop is designed for entertaining from two people to a large party. The rooms are suitable for different sizes and styles of parties. Guests feel relaxed and at home in our Victorian Mansion. We offer served meals featuring Prime Rib with celebration desserts such as Chocolate Overload or homemade Cheesecake. For the larger parties we offer full meal buffets of heavy hors d’oeuvres menu with delights such as Grilled Salmon, Herb Encrusted Mahi Mahi with Champagne Cream Sauce, Chicken Marsala and a wide choice of salad. Luncheons are by reservation only for groups of 15 or more. We are happy to prepare dishes for our vegetarian and vegan guests. Entrée Size Caesar or Mixed Green Salad served with your choice of: Shrimp $13.95, Salmon $15.95, Chicken $11.95. Sliced Pepper Steak $16.95Choose from the following dressings: Ranch, Blue Cheese, Honey Poppyseed, Italian, Balsamic Vinaigrette, Raspberry Vinaigrette, Thousand Island, or Oil and Vinegar. uniqueness for the cost. Some in our party thought it all excellent. Wonderful experience. The food and service were great. Love this place. Sorry, just not a fan. Shrimp was terrible, hard. The omelet station was the b st but that’s a lot of money for an omelet. Need some people checking for refills on dishes. The building was probably nice in its day but it is run down and not well kept. The food was marginal at best with a semi'tough NY strip. The service was terrible. The food was brought out and set on a stand feet away while we looked at it waiting for our server to serve it to us. My wife had to take my glass and find a waiter to ask for a refill. The reviews on Yelp gave this place 4.3 out of 5. We just didn’t see why? My wife ordered Filet Oscar style and the crab meat was burnt and nasty, and the bernaise sauce was like custard. My steak was excellent, but I got collard greens as a side and it looked like canned spinach. This place is absolutely beautiful, but we wouldn’t go back. Great Food, Great Service, Great Scenery!! Hubby and I will be back! Came to celebrate my birthday with family and friends, first time there and was impressed. Loved the building, grounds, atmosphere, food and our server, Angelo, was excellent. He gave us history, descriptions of food and was generally informative, polite and not intrusive. Also appreciated the piece of cake he gave me to bring home. We will definitely be back! There were 2couples eating 4 different meals. Each one of us loved the food. The atmosphere was wonderful. We have found our new favorite restaurant. This was our fourth visit. All were 5 star. The servings are large and presented nicely. The servers are polite and attentive. It is nice to go to a restaurant where you can carry on a quiet conversation. This is the second time I have dined at your establishment and I totally Love it!!! The service and food were great. The menu had good options and there were a lot of great specials to choose from. Address is incorrect on Open Table. Nice atmosphere overall. Live piano was cool. Crab dip was delicious. Combo seafood was good. Pork chop was dry. Caesar salad had bitter yellow greens. According to the waitress, it's always that way. Recommended changing that. A little too pricey for the quality. Dined there for Valentine's Day. Pleasant ambiance. Excellent meals and good service. Very enjoyable evening. Went for Valentine’s Day where there was a special menu. Appetizers were amazing with the pork ossa bucco and coconut shrimp. The she-crab soup was delicious and I wish I could have bought a gallon of it. Main entree was crab stuffed Chilean sea bass and then there was a dessert sampler. It was a perfect valentines dinner date with great food, great service and great ambiance . We both ordered the prime rib. Mine was overdone, his was underdone. The mashed potatoes were terrible and the asparagus was overdone. The salad wasn't great. Our appetizers were pretty good. The best part was the dessert. The whole meal wasn't worth the price we paid. We were very disappointed. I made my reservation online and there was no mention of a set menu for Valentine's day. For $55.00 a person, every bite should have been divine and it just wasn't. This place was beautiful and fantastic. The food was great and the service was awesome!!!! We had not eaten at the Hilltop in several years and recently moved back to Jacksonville. We opted for the Hilltop for Valentines Dinner as we remember it as classy and it’s near home. First thing that we found unusual was pads of wrapped butter on a plate. For a classy restaurant on Valentines Day that was something you would expect at Waffle House. My wife had the Coconut Shrimp, Manhattan Clam Chowder and the Sea Bass. I had the Baby Lamb Chops the SheCrab Soup and the Sea Bass. The Sea Bass was cooked perfectly and delicious. My wife felt the Shrimp was probably not made in house but previously frozen and prepared from a bag, the Chowder tasted like Campbells from a can. My Lamb also tasted like prepared from a bag and lacked any taste. I had remembered the SheCrab Soup from years past and my Soup failed to live up to my memories. It lacked any taste of Sherry so important to the dish. Still a nice place but as a fine dining experience failed to live up to its past. I would have given 5 stars BUT upon entering the parking lot the parking is atrocious. NO handicap parking at all and there was no handicap ramp into the building. So a handicap person has to climb the front steps about 6-8 steps. That is a lot when you are handicap. Hilltop, you really need to work on this. Once inside we were greeted promptly and shown to our table. Now the table was another issue. In a restaurant of this caliber the table was only screwed in underneath with 2 screws making it the most wobbly table I have ever sat at. We had to be careful that our drinks didn't topple over. I was going to ask to be changed to another table but it was very busy. Putting all of this aside (parking, access and wobbly table) the food was excellent and the portions are a very good size. Best prime rib I have ever had. The wait staff was very attentive and we had no issues with them whatsoever. It was busy but it was a nice atmosphere with the piano music in the background. So if you don't mind the parking and can walk up stairs you will find a very nice meal awaiting you. This was our first visit, celebrating an anniversary. Our meal was excellent and staff very accommodating. Loved touring the antiques in all the rooms. A great place to have a special occasion. The ambiance is fabulous. The piano player was great, just needed to play more. The food was good. The service was good, but slow. It took almost an hour to get our meal after our salads. Never have had a nice experience yet. The wait, the food ... service,etc. Nothing to really boast about or go out of our way for. It was our first time and we went at 6pm on a Wed. As we entered the bar area was loud, @ 5:45, and after a brief wait we were seated. The bar crowd soon spread and the noise level was low the rest of the evening. The menu was adequate, and it was a full meal with bread, salad, entree and two additional sides. The staff was friendly; due to a party, and decor seemed to be l980's but it has a unique charm and we believe older couples would enjoy it. The Hilltop was excellent as usual. We enjoy going there, in fact we were married there! Such a wonderful place to dine! Great food, very friendly staff. Warm, inviting and an overall wonderful experience. Have been for birthdays, anniversary and just for the enjoyment of dining there! LOVE IT and definitively recommend! We made reservations for 5:30 and arrived about that time. The waiter was not finished dressing (open shirt with t-shirt). He later put on a black shirt. We specified sugar free desert on the reservation but they did not have any. Apparently, they did not look closely enough at the reservation. The food was very good and gourmet quality. We were seated in a Florida room that was a little chilly. Overall, it was a nice dinner. We were in town to visit our daughter so it was only the three (3) of us. We couldn't have found a better place to celebrate Thanksgiving. Thank you for being open. The food was amazing and the ambiance for Thanksgiving was amazing. It was nice feeling like we were at someone’s house instead of a restaurant. The only complaint was the service. I get that it was busy as I work in the restaurant business but we didnt get our drinks half way though the meal and no refills were offered. I was charged a extra meal and gave him my card and asked him to run it after correcting it and it took him almost 20 minutes to bring back my card. We will defiantly come back to try again as everything else was amazing. Depending on how the service goes next visit we will update the review. I have come here for thanksgiving for the last few years and it's been great. This year the food was just not that good. The stuffing changed, the Turkey was dry and the roast beef was so tough you couldn't cut it. Do it the way you have done in the past and I will come back.